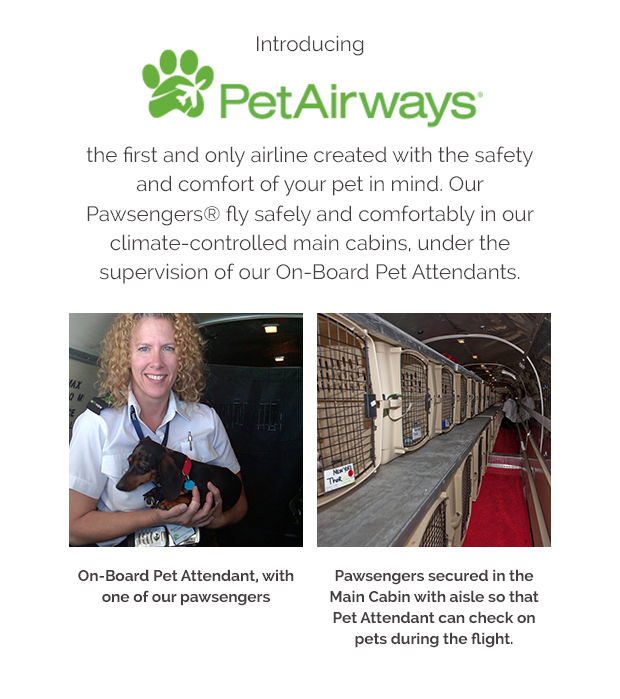 A pet-only airline where pets fly in the main cabin, not in cargo. To pet owners, pets are members of the family. Isn’t it time there was an airline that treated them the same? 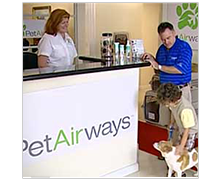 Pet Airways first launched in 2009 and was close to reaching profitability when we were forced to cease operations in 2011. A small amount of additional startup capital was needed to make it to break even. Unfortunately, because of the Great Recession, we were unable to secure that capital. During the two years that Pet Airways flights were in the sky, we flew over 9,000 pets in safety and comfort to 9 cities across the U.S. -- powerful proof of the demand for our service. Now, The New Pet Airways is coming back with years of operational experience and knowledge to once again provide this one of a kind service designed to help pets and the people that love them travel with ease. If you’ve ever traveled with your pet, then you know: it’s far from an optimal experience. Each year, more than 6 million pets travel by air. Sometimes, pets are able to travel with their owners, in the cabin, as carry-on luggage. However, if your pet is too large to fit under the seat of an aircraft, the only way to transport your pet by air is to put them in cargo. Here’s the problem: the cargo hold is designed for transporting inanimate luggage, not for living pets. It’s dark, noisy, and frightening. The air temperature is not monitored nor maintained and can range from below zero to 150 degrees. 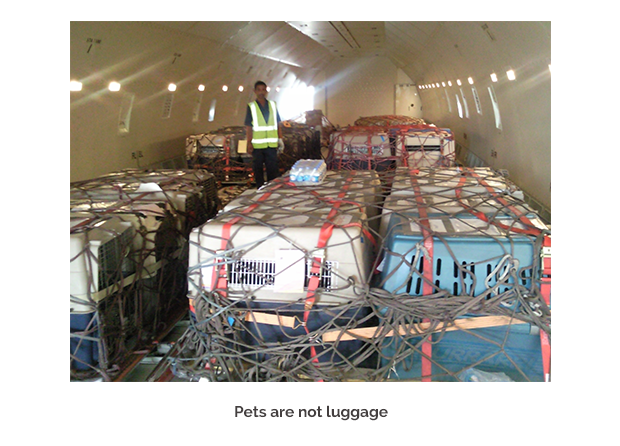 Many pets suffer physical and mental effects from flying in the confines of the cargo compartment. And sadly, stories of pets dying in the cargo holds of airplanes are not uncommon. With airline transport clearly not a viable option, many pet parents are forced to look for other alternatives. Every year, approximately 250 million pets are transported by means other than an airplane -- 40X as many as travel by plane. But driving your pet can be time consuming and stressful -- particularly when you are traveling long distances. It’s time that pet parents had a partner they can trust to safely get their pets from here to there. Pet Airways is that partner. Ours is the first airline that is purpose-built to transport pets in comfort and safety in the main cabin of an aircraft -- giving pet parents everywhere some much-needed peace of mind. Whether you are moving, going on vacation, or sending your pet to someone else, Pet Airways is the safe, comfortable, pet-friendly partner for transporting your pet. 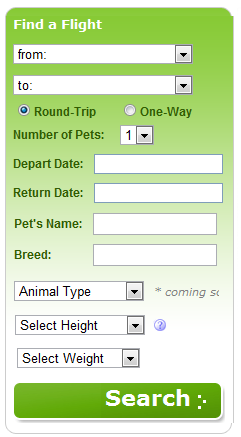 Simply book your pet’s flight on PetAirways.com, the same as you would a flight for person on a human airline, adding some additional pet-related information to help us ensure we know all about your pets needs so we can provide for your pet’s comfort. A couple of hours before flight time, bring your pet to our Pet Lounge. We double check that we know all about your pet, like what he/she eats, any issues, medical or otherwise, that we need to monitor, phone numbers of all authorized friends that can speak for your pet in case we can’t get a hold of you, and we check to make sure he/she has his/her shots and has a doctors note that he/she is OK to fly. Wish your pet “bone-voyage” as our team takes your pet into our comfortable, climate-controlled pet holding area, where we place him/her in their own pet-carrier that we provide at no charge. 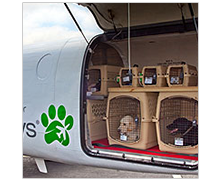 At departure time, we quickly load our pawsengers into the climate-controlled aircraft, where they are located right behind the pilot and our On-Board Pet Attendant who monitors their comfort during the flight. At the destination, we unload all pets and deliver them safe and happy to either the Pet Parent or a previously authorized person. They say that cats have nine lives - well, Pet Airways is a company with two. Pet Airways previously launched in 2009, during the midst of the great recession. Despite the overwhelming operational challenges presented by trying to launch a travel-focused company in the depths of the greatest economic recession our country has seen in decades, Pet Airways saw great success before being forced to close the business in 2011. 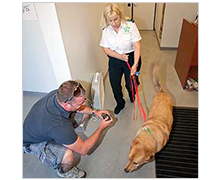 We were operational in 9 cities, with more than 9,000 pets safely transported between July 2009 and December 2011, and earned significant buzz from media outlets who recognized the important step that Pet Airways represented for safe and comfortable pet travel. Pet Airways also built, and continues to have a substantial social following, with more than 50,000 Facebook followers, 20,000 Twitter followers, and 45,000 registered newsletter recipients. Now, six years later, with the economy fully recovered and pet parents still looking to travel with their pets, the time is right for Pet Airways to return to the skies. We’ve taken what we learned from our first operation to build the world’s premiere airline for pet travel. Interested in learning more about Pet Airways and how you can be involved? Request access to the Business Plan tab of this profile, and we look forward to continuing the conversation! Dan has more than 25 years experience growing companies from the ground up in a variety of industries. As Vice President of Acquisitions for a national real estate investment company, he was responsible for the negotiation and purchase of over $300M(1980 dollars) in commercial real estate. Subsequently, he founded The Wendemere Group, a real estate development firm, which built custom homes with a total value of more than $20M. He then founded StitchIt Corporation, a manufacturer of women's swimwear, increasing the company’s output to 10,000 units per week with the aid of 50 employees, and producing goods for prestigious brands such as Guess?, Anne Klein and BodyGlove. He then co-founded Interlink Recruiting in Silicon Valley with his wife Alysa. Interlink was instrumental in helping startups in the new era of the dot.com. In 2005 he founded Pet Airways, the first and only pet-only airline. The company flew pets in and out of 9 different cities from coast-to-coast throughout the U.S., flying over 9,000 pets. He holds an MBA in Entrepreneurship from the University of Southern California and holds a private pilot's license. Dan's hobby is building homebuilt aircraft in his spare time. Alysa has more than 20 years experience founding and managing independent businesses in the services and retail industries. She began her career in the premium incentive industry, responsible for marketing and sales to large corporate customers. After moving to Silicon Valley, she founded Interlink Recruiting and Consulting with her husband Dan. She worked closely with top tier venture capital and investment firms, lending her expertise in start-ups to recruit startup skilled management teams and providing early strategic direction to many companies. Her most notable successes include Palm Computing (maker of the Palm Pilot PDA), and eBay. For eBay, she worked directly with Pierre Omidyar and Jeff Skoll, the founders, to build the early management team thus laying the groundwork for eBay's IPO and phenomenal growth. Many other companies recognize Alysa's contribution to their success (see testimonials on the Interlink site at www.ilrac.com/testimonial. In 2009, she co- founded Pet Airways. As Chief Development Officer, she was responsible for driving the marketing and PR effort. Her efforts resulted in articles, TV spots, website mentions, and personal interviews worldwide. Pet Airways produced over 5.8M results on Google. In addition, she was responsible for recruiting and managing over 50 employees for the company. Her experience in technology, marketing, public relations, partner marketing, building teams and general business skills are continually sought after by entrepreneurs and startups and she is currently consulting to Silicon Valley Startups. David joined Pet Airways officially in 2009, however, he was technical advisor and consultant to Pet Airways from the company’s founding in 2005. From 2004 to 2009, Mr. Crane was the Operations and Support Manager for ExtraView, Inc. where he was responsible for the design and implementation of a Linux – based co-location ASP Infrastructure. Working with company clients, his role was to oversee the support team, oversee client design specifications and implementation in multiple software environments. From 2002 – 2004 he was the VP and CIO of Technology for GloLinuear Systems, working on creating the company infrastructure, web presence and ground breaking video compression systems. From 2000 to 2002 he was Director of Information Services at Frontline now a marketing spinoff of Borland International. At Frontline Now he was responsible for Strategic development of Internet, Intranet, and LAN projects. Cost analysis, justification and installation of all IS-related projects presented to Company executives and board members. Between 1996 and 2000 he was a consultant to several high profile corporations such as CompUSA, Hewlett Packard, Adobe Systems and Symantec with a special focus’s on helpdesk management, network operations, web development and hardware support. This high tech background coupled with skills developed in mechanical engineering, construction, printing industry, quality control and warehouse management allows David to assist development of the company across almost all aspects from lounge design and build out to web site and reservations system development.